Pitot-Static Gage | THERMO Spoken Here! At the bottom of the image (right) is an equation that yields the rate of flow of air provided the pressure difference can be determined. 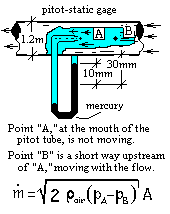 The density of the flowing air is ρ = 1.6 kg/m3. Use the hydrostatic principle to obtain the pressure difference. Exercise care when looking at distances. Also, if a mercury level goes down in one leg it goes up the same distance in the other leg. Start at "[A]" and follow a hydrostatic path to "[B]." (Hg means mercury). Calculate the mass flow rate of air through the pipe.